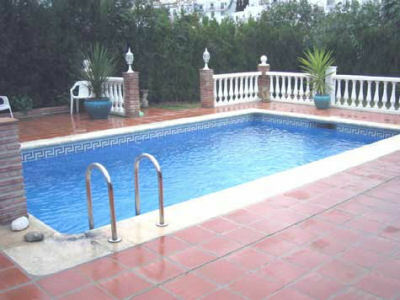 This is a superb 4 bedroom villa with its own private pool recently built and situated in a quiet area of Nerja about 1km from the town centre. 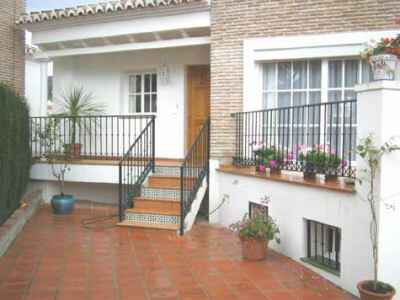 Enter through full sized locking wrought iron gates into a large patio area. Take the six steps up to the front door and enter into a small vestibule from which leads to the other rooms. The lounge dining area is spacious, light and airy. The dining area has a table and chairs in light wood and matching dining furniture. The lounge has comfortable settees, cable T.V. receiving many English channels, video and dvd. There is an air conditioning/heating unit in this room which is worked by coin control. One euros will give you 4 hours of heat or 6 hours of cold air in the summer. Double French windows lead to a pleasant enclosed patio area overlooking the pool and garden. The separate kitchen is compact but has everything you need. It is fully fitted with light coloured units, and has a dishwasher, washing machine, integral fridge freezer and electric oven and hob. There is also a microwave, toaster and electric kettle. On this floor there is also a guest cloakroom with w.c. and wash hand basin. Go down the marble curved stairs to large vestibule. From here there is a glazed door leading to the pool and garden. The first bedroom is of good size with a double and a single bed, fitted wardrobes, drawers and a ceiling fan. The second bedroom also has twin beds, fitted wardrobes, drawers and a ceiling fan. The third bedroom has a double bed, large fitted wardrobes, air conditioning which is worked by coin operation (one Euro giving you 4 hours of heat or 6 hours of cold air), and an en suite bathroom with bath and shower over, bidet, wash hand basin and w.c. The family bathroom is also on this floor and has a bath with shower over, wash hand basin and a w.c. All of the bedrooms lead onto yet another spacious area which would be ideal for children to play in. It has doors to an enclosed terrace which overlooks the pool. From the vestibule there are 4 steps which will take you to the pool area. The pool is a good size, measuring about 6 x 4 metres. It is nicely tiled with mosaic tiles. Next to the pool is a large covered pagoda with wooden garden style table and chairs. At the bottom of the pool there is the garden which has a large, beautiful built in gas BBQ and a sink. This is perfect for eating ‘el fresco’. The garden is laid to lawn with a feature flower bed in the centre. Take another 9 steps down into the separate apartment. This is of good size with table and chairs, twin beds, good size fitted wardrobes and a large en suite bathroom with bath and shower over, wash hand basin and w.c. The whole of the villa is tastefully furnished and well decorated. It is light and airy throughout and is ideal for either the larger family, or for two families. There is on street parking right outside the villa.